Perfect for a busy weeknight, One Pot Pasta is ready in a flash and clean-up is a breeze – just one pot! 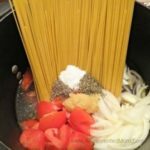 I’ve been making this One Pot Pasta dish for several years. 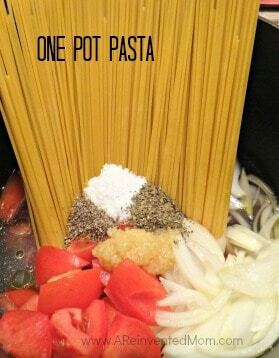 I love this recipe because it goes together quickly for an easy weeknight meal, and the clean-up couldn’t be easier – we’re talking a single pot! It also gets high marks from the entire family (believe me this is a rare occurrence!). I typically serve this with a salad, garlic bread and fresh fruit. Perfect for a busy weeknight, One Pot Pasta is ready in a flash. And clean-up is a breeze - just one pot! 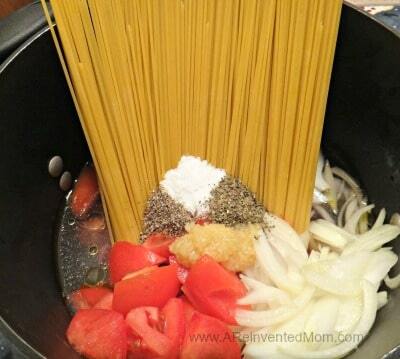 Add everything except the optional serving ingredients to a large pot and bring to a boil. Continue to boil over high heat, turning/stirring the pasta frequently until the pasta is al dente & most of the liquid has been absorbed (about 10 minutes). Season individual servings with additional olive oil, salt, pepper & Parmesan if desired. Follow A Reinvented Mom on Pinterest, Instagram and Twitter. This post was updated on 4-9-15.